(NaturalNews) The UK and EU populace doesn't embrace Monsanto's propaganda, and their governments are somewhat less dominated by Monsanto minions than the US government is. So traces of glyphosate in major British non-GMO food brands should be a huge red flag for us here in America. 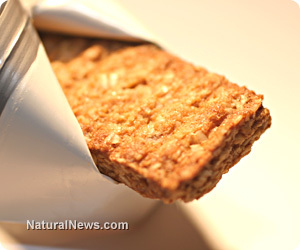 So how does glyphosate show up in those biscuits and breads where GMOs aren't grown? Well, RoundUp is such a popular herbicide that it's used on non-GMO grain fields. Normally, RoundUp destroys all plant life that's not grown from RoundUp Ready GMO seeds that are designed to keep the pesticide from killing those GMO corn or soy crops. But farmers can use it on non-GMO fields before planting to get rid of or prevent weeds from choking the new crops, and they can be used just before harvesting to make combining easier. That's how glyphosate can show up in foods from non-GMO grain sources. Only organic crops will be free of any pesticide residues. This affects non-organic farm animals adversely. A Dutch pig farmer raised a stink beyond even his large factory farm when he compared the differences in animal health and reproduction between GMO feeds and non-GMO feeds. Glyphosate alone is not the most toxic pesticide ingredient, although it's commonly considered as such. But it's the only substance used for testing by the EPA and government agencies worldwide. So the EPA has allowed larger amounts of glyphosate usage even as it has been showing up in human blood. RoundUp's extreme toxicity comes from combining glyphosate with chemical adjuvants to ensure rapid plant absorption of glyphosate. Glyphosate is considered the "active ingredient," while the adjuvants are considered "inert," pretty much like vaccines and their toxic adjuvants. If the recent Journal of Food and Chemical Toxicology retraction of Seralini's work has you confused, consider these two facts: Almost 800 scientists and thousands of other professionals have petitioned objections to the journal's condemnation of Seralini's work, and just prior to that journal's retraction, a former Monsanto scientist slithered into the journal's editorial staff. David Schubert, Ph.D. biology professor with the Salk Institute for Biological Studies, offers an excellent write-up defending Seralini's work here (http://www.utsandiego.com).